Mario & Sonic at the Olympic Winter Games, known in Japan and South Korea as Mario & Sonic at Vancouver Olympics (マリオ&ソニック AT バンクーバーオリンピック), is the follow-up to Mario & Sonic at the Olympic Games. This is the second collaboration between Nintendo and Sega under license from the International Olympic Committee (to correspond with the 2010 Vancouver Winter Olympics). The game itself features the hosting cities of the games, Vancouver and Whistler. 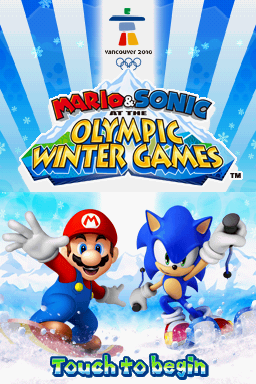 Like their previous installment, Mario & Sonic at the Olympic Winter Games was developed and released for both the Wii and Nintendo DS in October 2009, each with their own exclusive modes. The Wii version features a Festival mode while the DS version features Adventure Tour, a single player with quests and bosses from both universes. The Wii version can also utilize the Wii Balance Board for single player play. Sega handled the publishing and marketing duties for territories outside of Asia, while Nintendo catered for Japan and South Korea itself. Regular events set in real world locations. Alpine Downhill: A race through flags. Alpine Giant Slolam: Race through flags. Individual Ski Jump: A competition to get the farthest distance. Team Ski Jump: A competition to go the farthest distance and get the most points. Moguls: A competition to get the most turns points. Ski Cross: A race to the finish on skis. Halfpipe: A competition to get the most points. Snowboard Cross: Race to the finish on a snowboard. Speed Skating 500M: Race to get the fastest time. Short Track 1,000M: Race to get the fastest time. Short Track Relay: Race to get the fastest time as a team. Figure Skating: Compete to get the most points. Skeleton: Race down a pipe track alone to get the fastest time. Bobsleigh: Race down a pipe track as a team to get the fastest time. Ice Hockey: Compete to get the most points. Curling 16: Compete by rolling stones offensively and defensively to get the most points. Dream events are many of the same events played with items and playing in Mario/Sonic locations or bizarre new ones too. Alpine (Single & Team): Single - Same as Downhill and Giant Slalom. Team - All the teammates times combined and added up for the final score. Ski Jump (Single & Team): Single - Fly through space collecting star bits and star panels. Team - All teammates star bits combined and added up for the final score. Ski Cross (Single & Team): Single - Compete in a Mario kart-type match and aim for the fastest time. Team - Just like Dream Alpine. Snowboard Cross (Single & Team): Single - Race on snowboards for the fastest time. Team - Same as single dream snowboard cross except all teammates' times are added up for a final score. Short Track: Race through Eggman's base on skates. Bobsleigh: Race through space and time down a pipe track. Ice Hockey: Compete to get the most goals using Bowser Castle obstacles. Curling: Compete to get the most points. Snowball Fight: Compete to get the most points. Gliding (Single & Team): Single - Compete in the sky to get the most points. Team - Same as Gliding except there are not seperate scores. This page was last edited on 10 April 2019, at 15:55.